The double top and double bottom are very common reversal chart patterns. The double top is a bearish pattern that occurs after an uptrend. This means that when you see the pattern you will then look for selling opportunities. 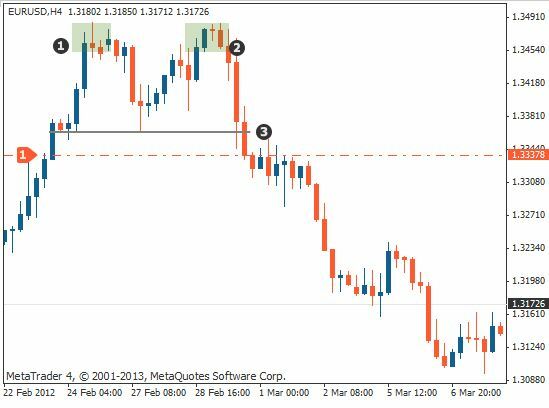 This lesson shows you how to identify the pattern and introduces two different ways to trade using the double top pattern. There are two highs, where the price has attempted to break through a resistance level twice before reversing to the downside. There is also what is called a "neckline", which is considered the bottom part of the pattern. What is happening is that the buyers have attempted to push the price through a resistance level at 1, but were unable to due to the sellers entering the market. There was a second attempt by the buyers, but they were unable to break through to new highs, shown at 2, because the sellers entered the market in force once again and overpowered the buyers. Once it became apparent that the buyers were unable to push the price through the resistance level, the price then reversed to the downside with more sellers entering the market. Take note that the price must break the neckline of the pattern in order for it to be a valid double top pattern. Once this pattern has been identified on the price charts, you are then looking for potential selling opportunities. We will now look at two different ways to trade the double top. The first way to trade this pattern is to look for the neckline that is marked on the chart below. Once the price breaks through the neckline, you can then enter the market with a sell order. 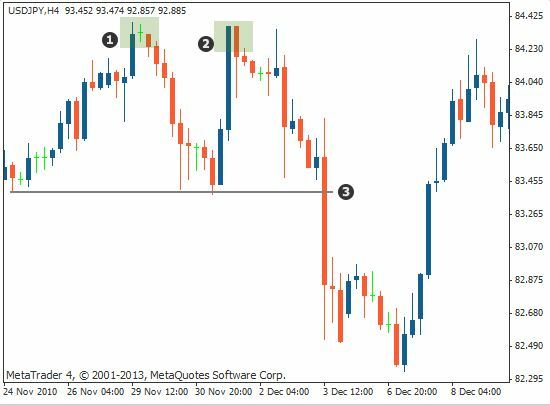 The chart below shows the neckline being broken by the price – this is where short traders can enter the market. The stop loss is placed above the double top. If the price trades beyond this point, the pattern has failed and you do not want to be in the market any longer. The profit target is measured by taking the height of the actual pattern and extending that distance down from the neckline. The second way to trade the double top pattern is to wait for the price to trade below the neckline (broken support) and then look to place a sell order on the retest of the neckline as resistance (broken support now becomes resistance). The stop loss would go above the new resistance area and the profit target would remain the same as in the first example. the double top chart pattern signals a possible move to the downside and potential selling opportunities. you can trade the pattern on the break of the neckline, placing the stop loss above the pattern and the profit target the same distance as the height of the pattern, down from the neckline. you can also enter after the price has already broken through the neckline and has retested it as resistance. 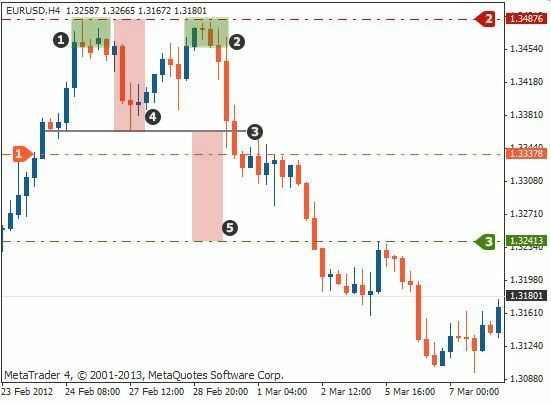 You place the stop loss above the resistance level and the profit target the same distance as the height of the pattern, down from the neckline.